The HC100 Tree Guard offers an attractive solution to tree protection. 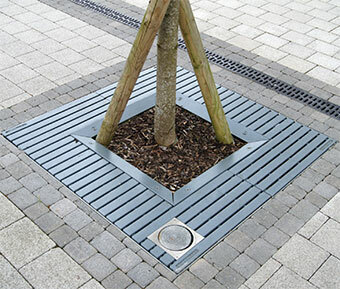 The tree guard and support frame are manufactured from galvanised steel and stainless steel. The tree grille is manufactured from cast ductile iron. Dimensions of Grille 1200 x 1200mm. 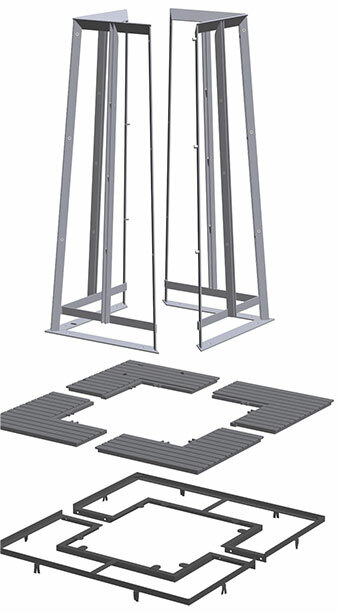 The tree grille is supplied in 4 sections. Stainless steel assembly bolts are supplied. The tree grille, support frame and tree guard are galvanised and powder coated, as we manufacture all our products in house we can arrange any colour combination you require. 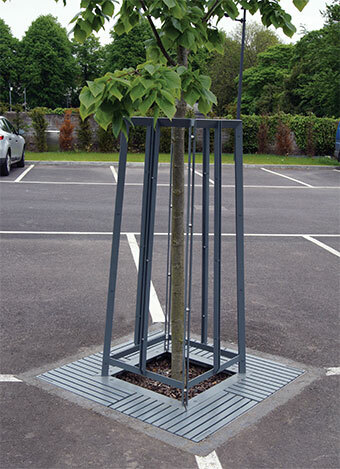 The tree grille is installed into a galvanised steel support frame which is 30mm, the castings are secured by the tree guard and corner locating points. If the guard is not required, the castings can be secured to the support frame separately for anti theft purposes. Installation requirements vary according to site conditions. Support frame is supplied in 2 halves and should be placed around the tree and bolted together, the fish tails need to be bedded in concrete. These can be bent down if required when setting into wet concrete. Once frame is level with finished surface and set in place, hook in the 4 No. tree grilles segments and secure at centre with bolts (supplied). Where tree guard is also used, castings are clamped in place when the guard is bolted down. Grille and support frame can be sold separately without the tree guard. The grille is available with 1 or 2 uplighters (spotlight not included). A facility for irrigation pipe is available.